In this swashbuckling dice game you set sail on the high seas in search of treasure. Discover gold coins on Treasure Island or plunder your opponent’s pirate ship to bag the booty and win the game. But beware you may be forced to walk the plank, draw swords with rival pirates to defend your loot, or your ship may be struck by a tidal wave! 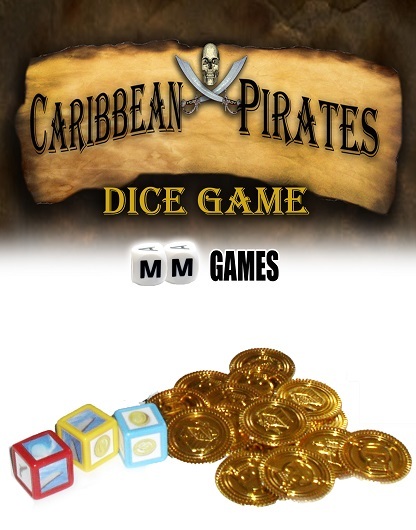 Caribbean Pirates is a fast moving family dice game for 2 to 5 players (age 6 and up). The PDF includes the dice faces, gold coins, and game rules. You will need to provide 3 blank dice (we recommend 19mm indented blank dice) and a printable adhesive sheet to print the dice faces on.